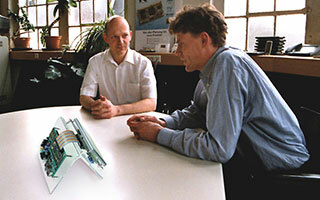 To overcome the challenges of testing single-board computers and evaluation modules built for customers developing embedded systems, Keith & Koep GmbH chose XJTAG boundary scan to maximise productivity and assist with improving assembly processes whilst integrating easily with its overall test strategy – all at an extremely competitive price. The company operates its own production facilities and has developed a custom test environment, comprising specialised hardware and software, complementing its quality-control processes. The XJTAG boundary scan test system is integrated in this environment, and performs advanced hardware tests on production Trizeps modules before loading programs and characterisation data into each unit. Like many other XJTAG users, the team at Keith & Koep appreciates the strengths of XJTAG’s high-level programming language, XJEase. It allows engineers to write and customise tests for JTAG and non-JTAG components without needing to understand how boundary scan works. Because the tests are device-centric they can also be re-used without modification in future projects. “XJEase makes boundary scan test faster and easier, and combines with features such as automatic scan chain detection, connection testing and pull-up/pull-down resistor tests to reduce test development time as well as cycle time,” confirms Wolfgang Goetz. With XJTAG integrated in our test environment we can complete all the necessary tests and programming in a single working procedure. This was our objective from the beginning, and XJTAG’s convenient external interfaces enabled us to achieve that goal. XJTAG also helps us pinpoint any assembly process issues and solve them quickly, and contributes to continuous improvement. The XJEase programming language makes boundary scan testing faster and easier, and combines with features such as scan chain detection and connection tests to reduce test development time and cycle time. We found our most-wanted features, at the most competitive price, in XJTAG. Keith & Koep GmbH of Wuppertal in Germany is a developer of single-board computers, modules and evaluation boards that help its customers speed up development of embedded systems. The company’s Trizeps range of single-board computers – named after the strongest muscle in the arm – is available with ARM and XScale processor architectures, delivering an “intelligent heart” that plugs into the system via a 144-pin or 200-pin SODIMM connector. The boards are densely populated, with major components including devices such as SDRAM and Flash memories, Ethernet controller, A/D an d D/A converters, USB PHY, and power management.